The reason for the sentence above is simple: Although Redline is absolutely not a bad movie (very far from it) it could have been fantastic movie, something that rocks the soul of any man…but unfortunately it doesn’t do that. Despite all the cool stuff that Redline throws on screen there seems to be the same amount of bad decisions regarding either pacing, setting or character introductions. In the end Redline has many problems which tarnish the incredibly well staged racing scenes a little bit. Redline truly shows that director Takeshi Koike (Dead Leaves) still has a long way to go and learn much from the masters before he can reach the heavens. But first things first, the plot outline. Redline is set in a distant future in which the illegal race called Redline is one of the biggest events of the whole galaxy, taking part every five years on a different planet. JT, a young and eager human racer, wants to take part in that legend of a race. Yet, during the qualification race, he almost dies from a horrible accident caused by his own friend who placed a bomb below the car. Surprisingly, JT can enter Redline after several teams dropped out. The reason? The government of the host planet – a militaristic dictatorship – is not amused at all by the announcement that Redline will take place on their planet and is set out to kill every racer who sets foot on their turf. JT isn’t impressed by this threat and starts to rebuild his wrecked car, not knowing that his friend is another threat lurking in the dark. The racing scenes are seriously some of the best action I’ve seen in a while. 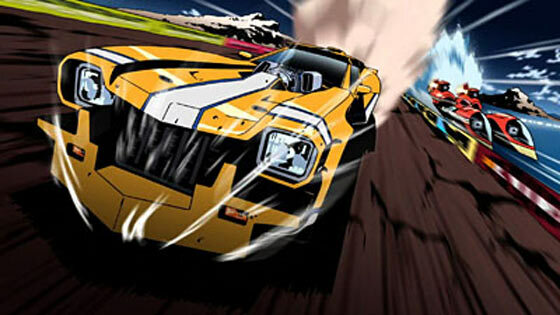 Since Redline is framed by two of such racing sequences (the Yellow Line at the beginning and the Redline at the end) those are certainly the highlights of this movie. Racing without rules never looked cooler or was more ridiculous and speedy. The final ten minutes are truly superb and absolutely satisfying while upping the ridiculous level even further. You have to see it and if possible on the big screen. It will certainly blow your mind. The style Takeshi Koike’s already used in World Record in the Animatrix anthology and perfected in Dead Leaves fits pitch perfect for this kind of movie. The world Koike brings to life really feels like it’s alive with its bizarre and often funny looking aliens and creatures. Despite my initial impression I got from the trailer, Redline’s also surprisingly slow. It takes its time to flesh out the main characters – especially the growing relationship of JT and the girl whose I name forgot – and the situation they will soon get into (there’s a clash in a bar, for example, with some authorities from the host planet). But this is where the problems start. Although I think it was a wise decision to give some room for the plot to breathe, I sometimes got the feeling that Redline was too slow. Even worse, I often got the feeling that – similar to Dead Leaves – many plot elements of Redline lead to nowhere. The other racers are a perfect example of that problem. The anime uses various expositional techniques (interviews, dialogue, flashbacks and so on) to present us the various contestants of the race. We learn some good amount of info about them. Yet, almost all those guys never get a chance to shine. You know who they are, but in the end they’re on screen for about thirty seconds or so. And that’s it, they do nothing of importance. I am still wondering why Redline used up so much time for them when it could have sped up everything remarkably. And god dammit, why didn’t Koike use the two girly racers and their fembot, which was so awesomely cool in the trailer. Sure, it’s there, but as everything else only for some seconds. Takeshi Koike also horribly fucked up at one occasion in terms of editing. After JT has sorted everything out and got his car, the final race is finally about to begin. I was sitting in my chair and started smiling like a kid, when it really began. And just when the awesome meter is about to reach the heavens, Koike cuts away from the action, only to present us some seriously irrelevant commentators giving us yet another exposition about yet another team. Seriously, at that moment I was short of going Hannibal. And this is one of those moments where it shows that Koike might be a genius at drawing, action, and framing, but still has a long way to go in terms of editing, pacing and characterization. Sometimes I got even the impression that Koike started to lose his overview of the situation or even forget some teams for a while. For example, at one point in the movie one team ends up digging its way into a high security underground installation. Although this sounds cool Takeshi Koike totally forgot to show us how they began to go underground and never showed us how they fare in the dark. They’re suddenly there and that’s it. What baffled me even more is a secondary plot about a military guy from the dictatorship who’s sent out to kill the racers. Since he has some old grudge with one team member he decides to go AWOL and participate. Although this was some of the funniest stuff of Redline Koike didn’t resolve or end this plot line at all. It is an epic waste here because I loved that whiny dude and his ramblings. The same can also be said about his friend who has some personal gambling problems but that as well didn’t really got fleshed out. In the end all those problems can be traced back to the fact that Koike still needs some serious training. He should really go to some anime directors to learn the art of directing. He’s a genius at the visual level but he seriously lacks at the structure level of a movie. If he’s able to sort out that problem I don’t see any reason why he shouldn’t become one of the big names in the industry or a legend in some decades. Don’t get me wrong here: although the problems mentioned are not minor you nevertheless need to watch Redline very, very soon. The action scenes alone are worth everything as they’re some of the best I’ve seen in a long while. And you really have to see it on the big screen. When Redline goes into its high octane mode, it delivers as almost no other racing movie I’ve seen. The action is plenty, colorful, psychedelic and ridiculous without limits. 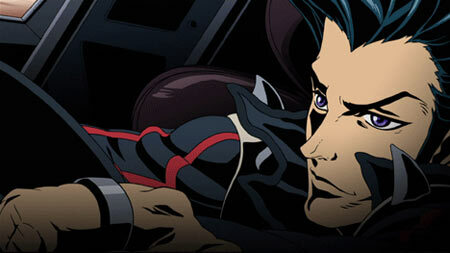 Redline is an action movie that is simply pure genius on the visual level, something you definitely have to see. Unfortunately, director Takeshi Koike too often forgets its characters and plot lines. And unfortunately Redline sometimes even forgets the one thing it was meant for from the beginning: ridiculous to awesome racing from start to finish. Koike should have left out the character introductions and spent more money on longer racing sequences. Now it’s your turn: did you see Redline? What do you think of it? Redline is a disappointment compared to its trailer. I saw it in Australia as part of the reel anime thing we have here from year to year, and when I say as part I mean as part 1 of 5 sequntial movies watched back to back over the course of 2 hours( what’s to say I live in a country town and could only get to the city for 1 night so I had to cram them all in). Anyway this movie was in my opinion the best one from that festival the others being the 2 eva movies, king of thorns and Summer Wars(think studio ghibli meets that online bit of the digimon movie) The only other part that neared this movie in respect to me sitting there gawping/ laughing/ Shrieking with excitement, was the last 5 minutes of evangelion 2.1 but it was still not a hint to Redline. Thanks a lot for sharing your thoughts about Redline! It’s cool to see that this movie makes its way around the globe. And yeah you are right, it will probably take a long time until Redline will be released on DVD. Yet I think that’s good because by then I can give it a rather fresh look and see whether or not my criticisms still hold. I’ve seen REDLINE five times now, and I’m always finding new things to enjoy in it. I truly think it’s one of the best animated films of the year, and it’s started the 2010s with a huge bang that will be very difficult to top. As per your complaints, I can’t comment too much as I’ve seen it in Japanese theaters without the benefit of any subtitles (and I am not a proficient enough speaker to grasp everything), but some of the comments you made seem to be based in a poor translation. For example, despite not speaking Japanese really well, even I could understand that the race commentators were explaining about JP and the other racers as they were descending to RoboWorld, not going off on a tangent at all but instead acting like regular sports commentators and continuing the whole ‘media portrayal’ angle of the film that was introduced as critical from the very first scene. So, the fact you said this seemed to come out of nowhere makes me think the German subtitling has just been bad and done you a disservice. Additionally, on-screen text explains what all of the various groups of people are doing and where they are throughout, so it’s easy to follow. And also, even not speaking Japanese I could understand the problems with the mafia that Frisbee is having, and at least some of the material with the RoboWorld soldier who joins the race. In short, I have a feeling a lot of what bothered you in the film isn’t the direction (which in my opinion, especially after seeing the film many times, is extremely tight and well-focused), but the translation of the script. As for that there should have been more racing… well, I suppose I can wish this too, but it would be kind of greedy, since they already spent a huge fortune making the film, and doing all the animation they did took 6 years… so I don’t think I could possibly ask for more. This is as much as can be done! So, I’m very satisfied. And also, the animation in the non-racing scenes is really interesting and has some good elements of style and performance that I love, so I really like watching this part of the movie too. I think if you watch it again with better subtitles you will get more out of it, just as I’m sure I will when I can watch it with subtitles and fully understand whatever I may still be missing (although I now am getting about 80% of the dialogue content pretty well from hearing it repeatedly). And yeah, in conclusion, I’ve just got to echo that this is an utterly fantastic film from a visual point of view, an unprecedented triumph, and you quite simply MUST SEE IT, preferably on the biggest screen possible with the best sound quality possible, and then as soon as you’re done SEE IT AGAIN as you will have missed 90% of the visual wonder on the first go-round just being amazed and exhausted by all you took in. Watching this movie is like racing: it’s an experience, not a film or a story really, and to get the most out of that experience, you must repeat it. And it’s an experience easy to get addicted to. I can’t recommend it highly enough. It’s great to see that you really love Redline. As I already wrote in my post I will definitely watch that movie again just to see if my complaints above still will be true or not. Regarding the subtitles: I’ve watched the movie with English subtitles. I think that the version I’ve seen should be the international one – probably. So there were no problems with the translation. Since I myself understand some Japanese in parts I am absolutely sure of it. Regarding the commentators: I fully understood the commentators and the role they play in terms of the ‘media portrayal’. But even though they were talking about the characters and their respective backgrounds I didn’t like the fact that they used up so much time for characters which in the end play only a really minor role in the plot. Takeshi Koike could’ve used that time much better. And sometimes he simply broke the flow of the moment. Especially when the final race is finally starting – only to jump cut to those talking heads. Really, I was screaming in my seat to see more of the epic racing scenes. I can fully understand your point, though: the animation is fantastic during the racing or to be more precise especially during the racing. The movie took six years to get finished, so the animation must have cost a ton of money. I think this is the most the production crew could squeeze out of the Yens it got, otherwise it would have taken another ten years. On the other hand I still think that Koike could used the slower moments for something better because in hindsight Redline still feels a little bit edgy. But that’s only my opinion after watching it once some time ago. 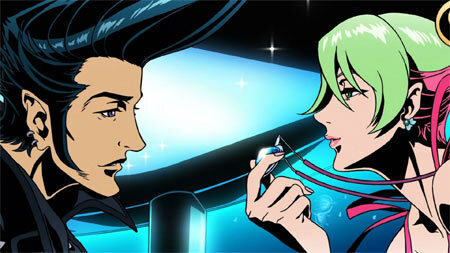 Again: I will definitely watch Redline again. I just saw it yesterday at the International Science Fiction Festival of Nantes, France, and was quite blown away. I agree with you, there are many ideas and designs that are sorely underused, but I absolutely didn’t mind, the excitement of the race totally getting the better of me. I’d rather have this than an under-designed, empty, lifeless world in which only a few protagonists are alive (King of Thorns, which I saw two days ago, was more of a letdown in this way, as were Tales from Earthsea a few years ago). This movie starts over the top, and almost always ever goes up from there. I didn’t mind the slower pace of other parts of the movie, I enjoyed it as a whole. I hope it will get a theater release in France, at least a DVD one. EDIT: is the year 2012 correct or shouldn’t it be 2011? It’s the English version, released by Manga UK. I assume that Redline is already availiable as DVD/Blu in Japan. Thanks for the informative review on the movie without revealing to much. I was very excited to see and get this movie, expecting only an average plot but awesome action. I’m somewhat disheartened by the fact that all those extra characters mentioned won’t get much characterization, since I was drawn in by not only the action, but the huge F-Zero like cast. This review tells me that you have a firm grasp of story telling and have alot of experience in terms of film and anime movies. Rock on. this is about the worst review i have ever read in my entire life. the characters represent their stereotypes and there is a “complex” story around the main character. plus there are no useless filler scenes. it is an action-racer movie in perfection. the music matches incredible with each scene, esp. in the end, which is horrible japanese romantic, which had to be part of the movie. there are 0 critics about the movie from my side, with a more complex story about that warplanet, the movie would have lost its focus. my only critic goes to the subtitles. i watched the movie +- 1 year ago, and at that time, the subtitles where pure white. sometimes you couldnt read them, like in the drugscene, where it was white on white…but i hope it will be better as soon as a fansub gets released. Yea.. I think you were a little harsh.. as most people coment it is an amazing movie.. besides no anime movie has to become a drama masterpiece yet.. take it as it is, I certainly I think this is one of the best anime ever. A good written script doesn’t necessarily mean it’s drama and not once did I consider Redline to be a drama. But even for a high octane action flick Redline simply has too many problems with its storyline and script as a whole. Just in case you didn’t know there’s an OAV that is sort of linked to this called Trava, featuring Trava and his mechanic Shinkai the two ex-military defector racers in Redline. Personally I think this is an awesome work, but yeah there definitely were some spots that could have been tweaked to make it absolutely brilliant. I would have liked to see a bit more on the other racers myself instead of the brief “fleshing out”, and more of the race itself like the digging underground part, but as a whole its still an awesome work. Perhaps it will be expanded upon in some form or another. Amazing movie, I was expecting something beautiful and this is beyond any expectations. I’m a huge fan of Dead Leaves and Trava, but this is quite different. Yes, it’s slow and it takes its time to build his story up, but that’s what I loved the most. You end up up caring about the characters, and it’s nearly impossible to wait for that damn last race. Tension is all over Redline. Dead Leaves is unique and there was no point going that way. Koike learned a great lesson from his work on it, and pushed it further. The beginning and the end of Redline are a total blast. Taking Redline seriously for its plot is like playing Mario for its story. It’s their, but it’s painfully obvious its selling point is elsewhere. I didn’t take Redline seriously and just took it for what it was, eye-candy. Also, 7 years of work right there, still blows my mind. Hmmm, did we watch the same movie? As far as I remember (been a time now since I watched and reviewed it) Redline used a good portion of its run time to establish the characters, the setting and the various antagonists…only to not use them fully later on. The amazing action sequences – which should be the main selling point – were there but not in an amount the trailer implies. Really, I expected a fully blown, over the top action movie from the first second to the last. 7 years is an awfully and mind boggling long time, that’s for sure. Thinking about it, this long production time might indirectly be a hint to why we got a movie that promised more than it delivered: the budget was too small for the director’s vision. dude, its fine your voicing your opinion and all but his name is JP, not JT. they say and show his name ALL THE TIME, c’mon dude. Have you seen The Woman Called Fujiko Mine? I’m curious to what you think of Takeshi Koike’s editing there?